The PumPing Tap might be just the green gadget that phantom power regulators have been looking for. It’s a smart socket that knows when you’ve turned your appliances off and if you don’t pull the plug out after ten minutes it pops your vampire power sucking cord right out. The concept was just honored with a Red Dot Design Concept Award for its innovative thinking around power use, and we have to say that we’d buy it for sure if it becomes a real product. Of course there are a couple of issues with the design. For a plug under your sofa for the television, you’re just not going to want to crawl under there every time you turn the TV off to plug it back in. 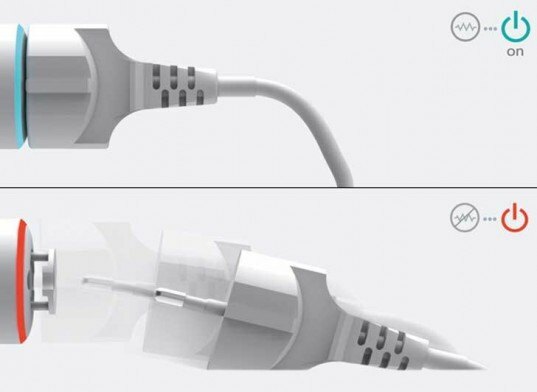 But for other more accessible sockets, this would work great. A coffee maker, hair dryer, toaster oven or cell phone charger would all work perfectly with this vampire power zapping gadget. The design is only a concept as of now but the team that dreamed up the idea probably got a bit of prize money from the Red Dot award. Might we see this little bugger on store shelves in the future? Well, colour me confused. Was it too difficult to just incorporate a physical switch? I suppose, in this case, a relay-based type? It could even be a solid-state one. Make it work along the same lines as a plug-in PowerBreaker-type RCD. Once the demand level falls, indicating that charging is complete (or the device has been put into standby mode - you would have to calibrate it first time round, I guess? ), it triggers whatever mechanism breaks the power and changes the indicator from ON to OFF (turning off a low-power green LED in front of a retroreflective red background, turning a coloured filter wheel connected to the switch mechanism, etc). Then to get it working again, you have to manually reset the switch, as the device is now itself completely unpowered. And it would work without all the complex jiggery pokery required to engineer something that can grip and push two smooth metal prongs out of itself... especially with the weight of some chargers' wall warts... and without the risk of damage either to said wall warts themselves or whatever they should fall upon once ejected. Heck it may need nothing more than a very simple alteration to a standard power breaker (which incorporates a full, failsafe-type, physical circuit breaker, a moving coloured indicator, and a manually-operated physical reset switch) - including even an in-wall power breaker twin socket (such as are installed around my workplace for plugging in cleaning and power tools). Just a circuit that taps off a tiny bit of current from the 110 / 230v feed, produces 3.3v DC from it, and runs a simple integrating ammeter connected to a low duty solid state relay that can bridge the live and neutral lines upstream of the RCD proper. As soon as that is triggered (by detecting a sharp, maintained fall in current - and therefore power demand), and before the short circuit can affect either the relay or the connected device, the RCD trips, cutting power to both the "vampire" charger and the trigger circuitry, reducing power drain to zero and leaving the electronics blanked and reset ready for the socket to be re-energised... Of course, it would have to be marked as no longer suitable for use as a normal circuit breaker, as this mod would probably compromise its efficacy... and it would be rather difficult to trace whether it tripped out as expected, or because of a genuine circuit fault. The PumPing Tap might be just the green gadget that phantom power regulators have been looking for. 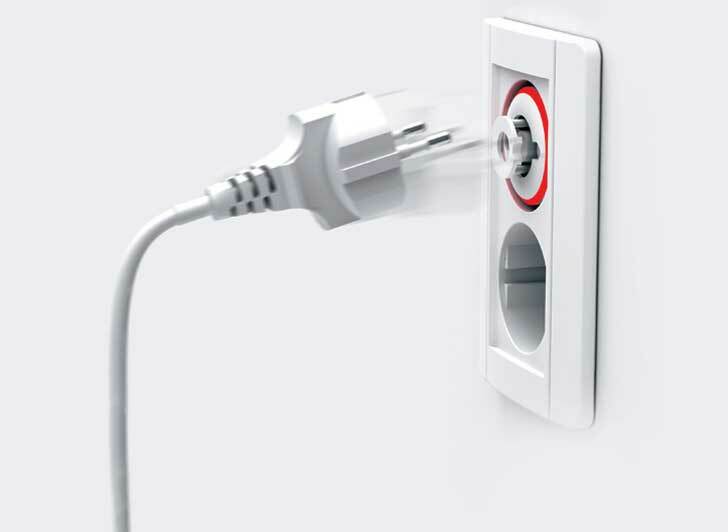 It's a smart socket that knows when you've turned your appliances off and if you don't pull the plug out after ten minutes it pops your vampire power sucking cord right out. The concept was just honored with a Red Dot Design Concept Award for its innovative thinking around power use, and we have to say that we'd buy it for sure if it becomes a real product.